I have to say, I’m excited about the new Twilight movie. The latest in the series, The Twilight Saga: Eclipse, has been given both a trailer and a release date and I cannot wait for it. You see, I’m decidedly not a fan of the Twilight movies as movies, but as wonderlands of potential comedy, I’m a huge, huge fan. They’re some of the worst things I’ve ever seen, but it’s just so, so much fun to sit and mock them the entire time that I always have a good time at a Twilight movie, even if I hate them (and myself, for giving them money). Maybe one of these days Robert Pattinson will be able to do an American accent! 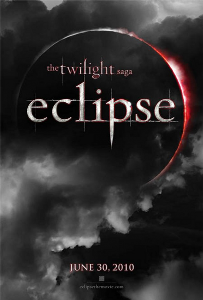 Eclipse is going to hit theaters in the US June 30, 2010. Get your tickets now, because if it’s anything like the last Twilight movie, you’re going to be hard pressed to find an available seat on opening weekend. Just make sure you bring your vampire-hunting kit in case any sexual deviant fake vampires try to attack you. Here’s the trailer. Try not to get too excited. Remember, it’s only a movie, and you’re not a teenager anymore. Unless you are a teenager, in which case I forgive you because you don’t know what you’re doing.